Heat oven to 350°F. Place six 6-oz. oval or round ramekins or custard cups in 13x9-inch pan. In medium bowl, combine egg yolks and 1/2 cup sugar; beat with wire whisk until light and fluffy. Add whipping cream, amaretto, vanilla and salt; mix well. Strain mixture into 4-cup measuring cup or another medium bowl. Pour about 1/2 cup mixture into each ramekin. Pour hot water into pan until halfway up sides of ramekins. Cover loosely with foil. Bake at 350°F. for 40 to 50 minutes or until edges are set but center still jiggles slightly when gently shaken. Remove ramekins from water bath; place on wire racks to cool for 30 minutes. Pour out water from pan. Transfer ramekins to same pan. Cover; refrigerate at least 3 hours or up to 24 hours before serving. Sprinkle each ramekin with 1 teaspoon sugar. Watching constantly, broil custards 4 to 6 inches from heat for 1 to 4 minutes or until sugar bubbles and is caramelized. Refrigerate at least 1 hour or up to 3 hours to harden topping. 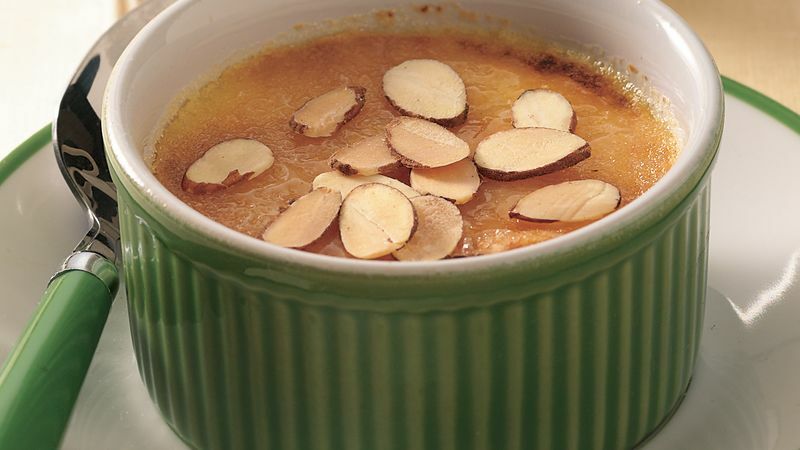 Just before serving, sprinkle toasted almonds over chilled crème brûlée. Store in refrigerator. Use coffee-flavored liqueur in place of the amaretto. Sugar scorches easily; watch it constantly when it is broiling. For a little more control, try caramelizing the sugar with a small kitchen torch available at cookware stores. Continuously move the torch over the sugar-topped custards in a slow, circular motion until the sugar melts evenly over the surface and turns a golden color.